Beal, Bob. "Red River Expedition". The Canadian Encyclopedia, 20 January 2017, Historica Canada. 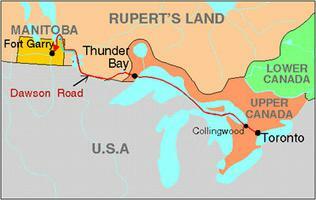 https://www.thecanadianencyclopedia.ca/en/article/red-river-expedition. Accessed 21 April 2019. Red River Expedition, the military force sent to Manitoba after the transfer of the Hudson's Bay Co territory to Canada in 1870. Wolseley won plaudits for his organization of the Red River Expedition. He later led the Nile rescue expedition in Egypt (courtesy Library and Archives Canada/C-20658). Red River Expedition, the military force sent to Manitoba after the transfer of the Hudson's Bay Co territory to Canada in 1870. Under Col Garnet Wolseley were 400 British regulars and 800 Ontario and Québec militiamen. 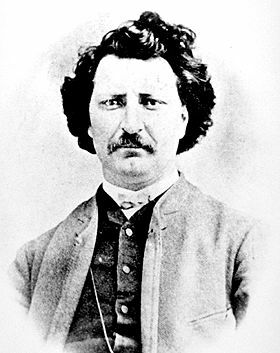 The government tried to give the impression it was not a punitive expedition against Louis Riel's provisional government, but the militiamen wanted to avenge the execution of Thomas Scott. The expedition left Toronto May 1870 and reached Fort Garry on Aug 24. They found the fort deserted for Riel had fled at their approach. The British quickly returned to Ontario, leaving the militia to garrison the community. Militia harassment of Métis exacerbated already intense feelings and assaults and at least one death resulted. Louis RielWatch the Heritage Minute about legendary Métis leader Louis Riel from Historica Canada. See also related online learning resources.